Many couples do not end up dissolving their marriage in court. In fact, in Texas, the legal expectation is that you and your ex will explore alternatives to divorce litigation before committing to taking your case to court. However, sometimes it is impossible to amicably resolve differences over the many legal decisions that are involved in a divorce. If that is the case, Meredith Clark Law can help you enter the courtroom ready to get the results you need for you and your family. Our lead attorney, Meredith V. Clark, combines an exclusive focus on family law litigation with a background in national and international commercial litigation. She is experienced and knowledgeable about financial and child-related issues in divorce and can strategize with you to get the most favorable results in your case. Another way in which our lawyer can assist you is in challenging motions that serve no purpose other than to harass you and make your life more difficult. 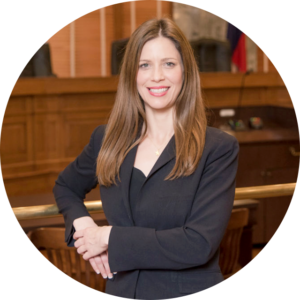 Ms. Clark believes the law exists to serve people, and she will employ her skill as a litigator to resolve your courtroom issues quickly and fairly. Before your case heads to court, there are difficult decisions you will need to make. When you meet with Ms. Clark in our firm’s Houston office, she will provide clear explanations of all the issues at stake and provide you with all the information you need to make a decision. In court, Ms. Clark will be your advocate, tirelessly fighting for your interests. She will keep you up to date on the proceedings and make every effort to secure a positive result for you. Our firm’s founding attorney cares about your situation and will fight for the best interests of your children. Fill out our online contact form to schedule a consultation.